Robotic Technology has improved and redefined vacuuming. A Robotic Pool Cleaner is a very effective way to remove debris and scrub all the underwater surfaces. Works independently of the pool pump and filter and requires no installation. A variety of Battery-Powered, Hand-Held Vacuums can help you vacuum the entire pool or do some spot cleaning. Cleaning up around the pool can keep dead leaves from being blown into the pool. A Water Sweeper Broom cleans decks, patios, walkways, pool covers and more, 3 times faster, while using 1/3 the water. How to effectively clean or vacuum a pool. Automatic or Robotic Pool Cleaners are available for all types of pools: inground and above ground, masonry, vinyl or fiberglass pools and big or small pools. Some cleaners need special hook ups and external motors. Others need only to be plugged into a skimmer intake. Robotic Pool Cleaners use low-voltage electricity and require only a simple GFI protected electrical connection. Robotic Pool Cleaners are programmed to cover the complete pool surface and the built-in filter bag acts as a second micro-filter. Systems that are highly automated are available. Your needs and budget are considerations in determining a choice. Robotic pool cleaners not only help keep the bottom and walls clean, but they act as a moving or roving main drain and help to improve water circulation. The improved water circulation will help to better maintain the water chemistry, help produce crystal clear water and reduce the likelihood of algae growth. They will save you time and effort and give you a better looking pool. There are a few other cleaning options, worth considering. Portable, Battery-Powered Vacuums can be used to clean everything, from a spa to a large pool. A Robotic, Solar-Powered, Floating Pool Skimmer-Cleaner can remove leaves and debris, before they have a chance to sink to the pool floor. Using a Water Sweeper Broom to clean the areas surrounding a pool, can keep leaves, insects and debris, from getting blown into the pool. Better skimming always leads to a cleaners Pool Surface Skimmers are available to suit every pool need. If problems arise, refer to the Pool Problems Page, as a source of problem-solving information, broken down into various categories. Scroll down the page and click on the linked keywords, catch phrases or images, in the archived answers below, to access additional information, on that topic or product. ► How To Deal With Lots Of Leaves And Debris? What type of cleaner would you recommend for a 17 x 23 x 8-foot deep salt water pool, which gets both a lot of leaves and small dirt and debris? I am not sure that the solution can be found in a single cleaner. A solar-powered robotic pool surface skimmer and cleaner will scoop up most of the leaves and floating debris, before it has a chance to sink. There are two models to consider. The debris that does sink to the pool floor can be removed, by conventional vacuuming. A suction-powered automatic vacuum is not recommended, because it would render your pool's skimmers useless, during operation, and that might only add to the problem. A robotic pool vacuum-cleaner operates independently of the pool pump and filter and will remove all of the debris, on the pool floor. We do offer 4 high performing models. Lastly, if you keep the pool surround cleaner, this will allow less debris to get blown into the pool. A water sweeper broom will help you sweep the debris, from decks, patios, walkways and more. It does it using 1/3 the water and in 1/3 the time, as compared to a garden hose. We hope that the information provided was helpful. ► An Automatic Pool Vacuum And More? We have an inground vinyl pool, 18' X 36' and are considering buying an automatic pool vacuum. Do they really do an effective cleaning job? Any recommendations? Thank you. Automatic Pool Vacuums are really great products. Not only do they do an effective vacuuming of the bottom, these products improve the water clarity and because they improve the circulation, across the bottom, make algae growth less likely. I have had three different types: one that required a separate booster pump, a Robotic Pool Cleaner that operated on low-voltage and a suction side cleaner that attached to the skimmer. They all worked, but without a doubt the Robotic Pool Cleaner worked the best. It cleaned all the surfaces: bottoms, walls, steps and the waterline area. They are much less expensive to operate than the units with the separate booster pumps. This is no installation and it does not interfere with the pump or the filter operation. In fact, it acts as a second filter. No installation or hose hook ups are required, power consumption is low and it operates independently of the pool pump and filter. Good luck and enjoy pool. Instead of waiting for the skimmer or pool vacuum to remove floating debris, is there a better way? There are several options. Remote Controlled Pool Surface Skimmers, Return-Jet Powered Pool Surface Skimmers and Pool Skimmer attachments, for use with most suction-side pool cleaners. There are all good products. 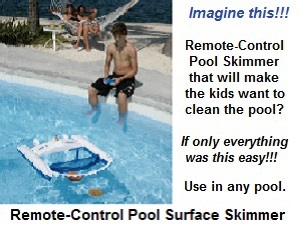 However, only the Robotic Pool Surface Skimmer operates fully autonomously, throughout the day. It helps filter out fine debris, improves circulation as even acts as a tri-chlor feeder. It will eliminates dead zones and allows you to shorten the filter cycles. It doesn't entirely eliminate the need for vacuuming, but it keeps the pool cleaner, for longer periods of time. I hope that this information is helpful. My question is about circulation boosters. Are they a good purchase? We are buying a 20 x 40 roman pool and one pool guy said we would need 2 units, while another said we don't need one at all. We will be putting in a main drain, in case that factors in. Thanks so much! Confused? I don't blame you. The product is designed to increase the return flow action and help lift material off the bottom and eliminate the dead spots. You will still have to vacuum the pool, to remove debris from the bottom. The Circulator will provide improved circulation and that will equalize the water temperature. That's the plan. Having a main drain is a plus, under any circumstances. I suggest that you consider a robotic pool cleaner. They come in sized for pools like yours, you'll only need one, it will vacuum the entire bottom and walls, it has a built-in micro-filter that will remove dirt and not just raise it off the bottom, it will act as a moving main drain and will improve circulation and equalize temperatures, it operates on low voltage, requires no plumbing and is inexpensive to operate. I hope that this information will prove to be useful. I have a recurring problem with mustard algae. I have followed some of the recommendations that you have provided under the yellow mustard algae topic. The problem does seem to be under control. My question is, do you think that an automatic pool vacuum will make a difference? The pool is a 16' x 32' inground vinyl pool. Thanks for the help. It certainly won't hurt. The pool vacuum will help improve water circulation across the bottom and all of the nooks and crannies. And that's where algae tends to gain a foothold. Robotic pool cleaners have built in micro-filter bags that can help remove dead algae and very fine debris. Because mustard algae tends to be powdery, the automatic robotic pool cleaner should help remove it from the underwater surfaces. Did I mention that it will save time and effort? Good luck with your decision. We are in Australia and live on a farm where it is very dusty. Our 48,000 litre fibreglass pool seems to have dust settled on the bottom edge all the time, even after constant vacuuming (manual) and cleaning cartridge filter. We have a salt chlorinator, which I have to clean daily because of calcium build up due to our bore water. Are there any products that could bind the dust so the filter could catch it easily. I am also using a skimmer sock that I change daily. On the subject of the calcium there is always the white deposit on the bottom of the pool. Is there any product to soften the calcium before it gets to the cell or any suggestions at all. Even if I got an automatic self cleaning cell ,won't all the calcium go straight into the pool and lie on the bottom until I vacuum? Thanking you and am hoping you can help me. Where do I start? The manual vacuuming is only doing so much and adds the material to the filter. The wind blows and the problem returns. I suggest that you get a robotic pool cleaner. This product can be operated independently of the pump, whenever you want, and will act as a second microfilter. It doesn't throw the dust around. It removes it! This should make a big difference and might improve the salt chlorinator performance, as well. Adding a Nano-Stick Clarifier, which lasts 4-6 months, can help you improve water quality and clarity, without adding to build-up problems. It sounds like nothing short of a self-cleaning salt chlorine generator will suffice, although you could try adding a calcium sequestering agent to the water on a regular basis. It might help the electrode plates stay cleaner longer and help prevent scaling in the pool. Good luck and I hope that this information will help. ► To "Clean Me Best"? Have a pool that is a "figure 8" shape and about 25,000 gallons. Currently have a "4 year old" cleaner that will no longer climb up walls or out of the deep end of the pool. It operates hooked up to our skimmer. So many choices, but I'd really like to go electric. Looking for educated suggestion on what brand and/or model would "clean me best." Thanks. I would opt for a Robotic Pool Cleaner, as they are very easy to use, effective, do not require any plumbing or installation and operate on safe, low-voltage power. They even act as a roving micro-filter. There is not much that you need to do, other than a simple, occasional cleaning. In our Website Store there is a wide selection of models and one of them will be just right for your pool. They don't just throw the dirt around. They cover the entire bottom and the walls and remove the dirt. There are models for vinyl and gunite pools to choose from. Cleaning up can be simple. Enjoy the season. How to maintain a cleaner pool, with less work. Use a Return Jet Powered Pool Skimmer to add extra suction and cleaning. Use a Robotic, Solar-Powered Pool Skimmer, to remove floating debris, before it can sink. Keep the pool surrounding cleaner and less debris will end up in the pool. This Robotic Pool Cleaner operates independently of the pump and filter, for better results. A Return Jet Powered Pool Skimmer provides extra suction power, utilizing the flow of the return jets. This Solar-Powered, Robotic Pool Skimmer and Cleaner works all day long, to keep the pool clean. Use a portable, hoseless pool vacuum to spot clean an area or the whole pool. Choice of models. A Water Sweeper Brooms cleans 3 timers faster, using 1/3 the water and in 1/3 the time. I have a fibreglass pool with an acrylic spa. The entire pool area is screened in. The pump/DE filter/gas spa heater package is located outside about 40 feet from the center of the pool and about 25 feet from the skimmer end of the pool. It is all 100% inground pool/spa and is plumbed below ground. There is also a "heat pump" pool heater that is about 60-70 feet from the pool (installed a few years ago). The pool was installed in 94 when the house was built. I have used an automatic pool vac from day one but over the last 6 months the vacuum has been very difficult to keep working properly (this is the 2nd one in a 10 year period). I bought a new and different unit to replace the old one. Today, when I installed the flow measuring device into the vacuum hose to calibrate the flow in the dedicated vacuum port in the pool, I found that I could not get enough flow to even move the piston in the measuring device (which is a clear plastic tubular piece with a spring loaded piston that indicates flow by piston movement compressing the internal spring). I tried various settings on the valve at the pump that controls the split of return water between the skimmer and the vacuum port but nothing worked. The pump would simply cavitate. The is the original pump, that was installed with the pool (10 years old). Could the pump rotor or impellor cavity be worn sufficiently to cause the pump to be very inefficient and not be able to flow enough water to run the pool cleaner? Incidentally, I tried the cleaner using the skimmer port as well and there was no difference. (still would not work). The question is: Do these type of pumps lose pumping power with age? I would assume that the answer is yes, but wanted to confirm before spending the money for a new pump. Thanks for any guidance. I suppose that it is possible that there is an impellor problem. I am not an expert in this area, but I would hazard a guess that the pump might seize or that the running sound would be noticeably different. I believe that there are more likely causes of the problem. Unfortunately, you did not provide me with the filter type or any indication of pressure readings. I suggest that you check the return flow. If it is not strong, that would be indicative of high filter pressure and the causes could include: Clogged pump strainer basket, blockage on the lines or clogged filtration media. If you have a sand filter, it may have been affected by high levels of calcium hardness. You might need to replace the sand. If you have a cartridge filter, it may have been affected by calcium deposits and may not have the proper porosity. In this case, I suggest that you replace the cartridge - you should replace the cartridges periodically or at the very least clean them by soaking overnight in an acidic cleaning solution. High pressure is indicative of inadequate water flow through the filter and would explain the problem with the automatic pool cleaner. There is one type of cleaner that would have solved many of your problems: the robotic pool cleaner. It does not use the pump or filter and actually functions as a second moving filter. Something to consider? I hope that this information proves helpful. Best wishes for the holidays. ► Not Quite Perfect Pool Water? My water seems to be perfectly clear in the morning. After the kids start using the pool, I notice that the water is not as clear as I would like. The pool is big rectangular above ground. I'm not sure about the size. I test the water and can find nothing that needs to be corrected. The next day everything is fine and it starts all over again. How can I avoid this problem? Having a group of kids jumping into the pool and swimming about is apparently stirring up some silt on the bottom. This fine silt is causing the change in the water's appearance. Make sure that the filter is operating during these periods. Filters can't remove silt from the bottom. H owever, once the swimmers raise the silt, it can be filtered out and the problem will slowly get better. If you don't have an automatic pool cleaner, it is something to consider. It is an especially important, in the case of a large above ground pool. Adding a Robotic Pool Cleaner will act as a moving filter and will vacuum the bottom and remove the silt. It is best to do this before the kids jump in. You might try to vacuum more often, again in the morning before the kids stir things up. Lastly, you should try using Nano-Stick Clarifier, which helps oxidize and destroy fine particles, that detract from crystal-clear pool water. The Nano-Stick is simply hung from a ladder or rail and lasts for 4-6 months. Sounds like the kids are enjoying the pool. Have a good summer! DEAR ALAN, WE INSTALLED A POOL CLEANER WITH ITS OWN BOOSTER PUMP IN OUR NEW POOL. IT'S TRULY AMAZING IT'S ALMOST AS IF IT'S ALIVE AND INTELLIGENT. MY POOL GUY INSTALLED IT BETWEEN THE CARTRIDGE FILTER AND THE HEATER. THE TEMP RISE ACROSS THE HEATER IS NOT ABOVE NORMAL, SO I DON'T THINK IT WILL HARM THE HEATER BY STARVING IT . THE WAY SOME OF THESE VINYL POOLS ARE MADE ALL THE RETURNS AND SKIMMERS ARE ALL UP SO HIGH THAT IT SEEMS THAT ONLY THE TOP THIRD OF THE POOL GETS FILTERED AND HEATED. I WOULD HAVE HOPED TO HAVE THE CLEANER DISTRIBUTE FRESH HEATED WATER TO THE BOTTOM OF THE POOL AND HELP TO EVENLY HEAT AND FILTER IT. THE POOL IS ONLY MODERATELY USED AND IT'S ABOUT 24,000 GALLONS. HOW LONG SHOULD I CYCLE THE AUTO CLEANER? SHOULD I ALSO CYCLE THE FILTER PUMP? AND LASTLY, SHOULD I RE-PIPE THE BOOSTER PUMP TO THE OUTLET OF THE POOL HEATER OR AM I JUST THINKING TO MUCH? THANKS. It doesn't sound like you have a main drain. It would have provided better top to bottom circulation. The robotic pool cleaner will function as a roving main drain. Pool cleaners normally are not operated daily, but as needed or several times weekly. You could operate it a few hours daily, to help turn the water over. The filter should be on a timer and operate 6-12 hours daily, depending upon individual circumstances. I don't think you have to do anything with the booster pump location. To improve circulation, try pointing one return downward. Even better would be to add The Circulator. These inexpensive, easy-to-install devices can boost the circulation by as much as 1500%. I hope the suggestions help. Enjoy the season. ► Low Voltage Pool Cleaner? My friend has an automatic cleaner that he says operates on low voltage. Is it really safe? I am looking to get one for my inground pool. Please advise. Thank you. Normally water and electricity do not mix. In this case, all of the electrical components have been designed for underwater use. In addition, as added protection the cleaner must only be plugged into a receptacle that is protected with a Ground Fault Interrupter (GFI). The robotic pool cleaners do an excellent job of cleaning the walls, bottom and waterline area, without interfering with the pump or filter. I hope that I have been helpful. ► Not Doing The Pool Cleaning Job? Can you tell me how to get a suction-side to circulate the whole pool instead of staying in one area. Alan, would the pool eyes have anything to do with it? Which way should these point if it is relevant? The pool is an hour glass shape with an eye on opposite sides at about 1/4 from the end. Thanks. Take the hose out of the pool and straighten it out. Leave it in the Sun to help smooth out the curves. Put it back in and hope for the best. This type of cleaner does have its limitations. By contrast a Robotic Pool Cleaner can be programmed to cover the entire pool. The shape of your pool would be a challenge for most any suction-side cleaners. You want the eyeballs positioned to send the water flow towards the skimmers. This could be influencing the cleaner. Good luck. Have a good season.